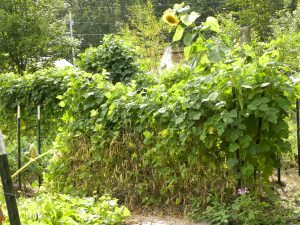 Welcome to Living Land Permaculture and Amy & Steve’s adventures in homesteading! Living Land Permaculture is where Amy and Steve are creating a homestead using permaculture ethics and principles to regenerate an unmanaged piece of land in New Hampshire. We work to grow truly healthy food for ourselves and meet many of our other needs here in this place we are now rooted, while also creating a healthier environment for other critters around us. We love to share and teach others through example and classes – and now this website! We believe that many others will find the same satisfaction from living a land-based life. 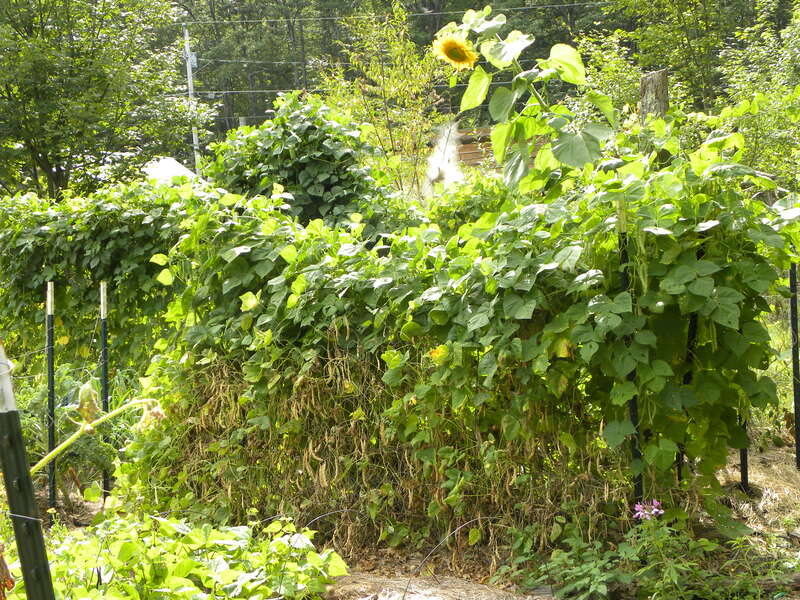 As activists for social and environmental justice, permaculture is a great fit. It also speaks to our pagan hearts! 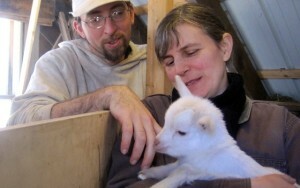 Amy and Steve are partners in the homesteading, but Amy will be the one doing the writing on this site. 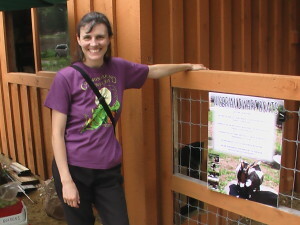 I, Amy, found permaculture through my work on organic farms, which began in 1997. I had recently developed an interest in healthy foods due to chronic health problems leading me to look into alternative healing, herbs, and healthy food and lifestyle choices. I joined the local food cooperative where I met a woman who at 25 years old was a passionate advocate for organic farming and was helping launch the first CSA (Community Supported Agriculture) in Seacoast NH. Stacy became a friend, and I joined the CSA with a working share and found I loved the work. The next season, I was hired as an official farm hand. Even though I loved organic farming, I started to see areas where I still questioned how sustainable it really was. The tractor driving on the land, the tilling, the bare soil… it didn’t feel right to me. When I discovered permaculture, I thought “Aha! Now here’s a system that might really work long-term!” I started going to classes, reading, trying it out, and took the full Permaculture Design Certificate course in 2006. Permaculture also fit perfectly with my social justice activist work. I had changed my major at UNH to Women’s Studies (graduating in 1996) where I learned about how larger systems affect our lives and our world and got involved in social change. Steve and I met in the activist world in the late 1990s. We both worked on environmental and anti-corporate globalization campaigns and shifted more to peace activism after September 2001. We learned a lot about power structures, and how our choices affect the world and we really wanted to take some of our power, money and time back from larger entities we didn’t feel we had a meaningful say in. We can’t do that with everything – we still drive a car, for instance – but growing much of our own food seemed within reach. It also feels good to be involved in a movement focused on building a new system while we continue to challenge systems we see as unjust. It’s my personal version of the two hands of nonviolence: the hand that says no to injustice, and the hand that says yes to justice. Larger change takes more time than growing a carrot – I need both! I also found in myself over the years a love of teaching, of empowering others to DIT (Do It Themselves) rather than sell them what I’d grown. Steve and I finally found and bought our own place in November 2008. It was not the flat open field surrounded by acres of woods as I’d dreamed. And we didn’t end up building the straw bale house I’d wanted. What we did get was a rocky, sloping woodlot with a mostly conventional house already on it. It did have a central wood stove and was sited properly for solar. It already was set up for some passive solar and we have since added PV panels. Beyond homesteading, Amy organizes the Seacoast Permaculture Group, Steve does computer consulting and serves on the local planning board, Amy teaches Sacred Circle Dance and Frame Drumming and co-hosts a local storytelling show, and we continue to do community and activist work. It’s been a challenge and a lot of work, but we have made progress and are always learning a lot. I look forward to sharing this journey with you!